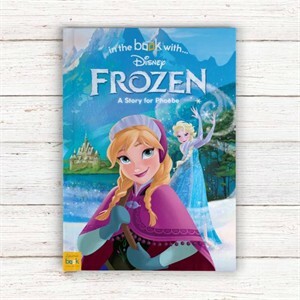 This Personalized Frozen Book is an amazing gift for the Disney lover in your house. After its theatrical release, Disney's Frozen become a smash hit and a cultural phenomenom. Thanks to this storybook, you can have a piece of the movie at your bedside! A faithful retelling of the story, this picture book shows Elsa's journey of strife after accidentally trapping her Kingdom of Arendelle in an everlasting icy winter. In order to right her wrongs and reach peace, Elsa needs the help of Anna and friends like Olaf the snowman. They must remove Duke of Weselton and Prince Hans from power! Have your loved one be a part of the famous Disney story and customize the book to have their name appear throughout the text. In addition, add their name and a personalized message on the first page. Gift boxes are also available to purchase with this item. Availability: This Personalized Frozen Book takes approximately 4-5 business days to leave the warehouse plus transit time.